Rabbi Andrew Bloom, left, and Fort Worth Mayor Betsy Price light the first candle of Hanukkah at Congregation Ahavath Sholom’s community celebration Dec. 2. Congregation Ahavath Sholom staff wanted to mark the beginning of Hanukkah by bringing the community together to break the unofficial record of spinning 1,300 dreidels at once. But, even with 400 people in attendance, they fell short — a yeshiva in New Jersey still claims the Guinness Book of World Records honor. At least, Rabbi Andrew Bloom said, they can claim a record in Tarrant County. Even if they fell short of their goal, the lighthearted evening marked another series of firsts for the congregation during the season. “This was the first time we had the community dreidel spinoff,” Bloom wrote in an email. However, we have held other community Hanukkah events at the ‘shul,’ like the Lego Hanukkah menorah.” Students enrolled in the Learning and Engagement Center also dedicated a handmade tallis, and a different Lego menorah was also on display in the foyer. Fort Worth Mayor Betsy Price joined Irwin Raffel, a 93-year-old Army veteran who fought in the South Pacific during World War II, and Bloom in lighting the menorah. They were flanked by eager, sometimes interruptive children, excited to participate. The chocolate gelt handed out with the dreidels may have influenced their enthusiasm, too. Other youth events include a de-escalation seminar and simulator Dec. 16 at the Bob Bolen Safety Complex in Fort Worth as part of a wider discussion of pikuach nefesh (saving a life). The center houses training spaces and headquarters for the city’s police and fire departments. 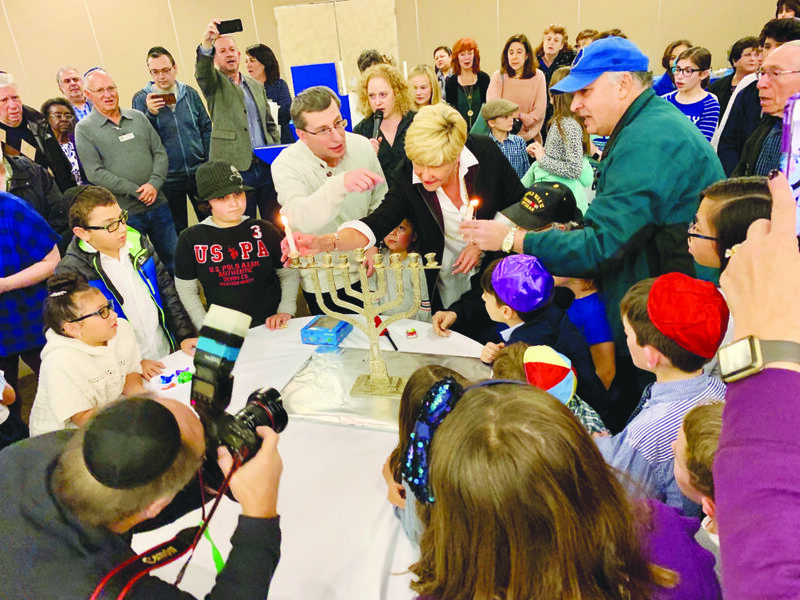 “Hanukkah celebrates both the courage of the Maccabees and the miracle of finding oil in the Temple that lasted eight days instead of one,” Bloom said. “In today’s modern society, it is a reminder and call to bring light through the example of personal strength, integrity and Jewish values to the larger and wider community.